South Korean major leaguer Kang Jung-ho has donated money to help relief efforts following a forest fire that engulfed the east coast regions of his native country, his Seoul-based agency said Monday. 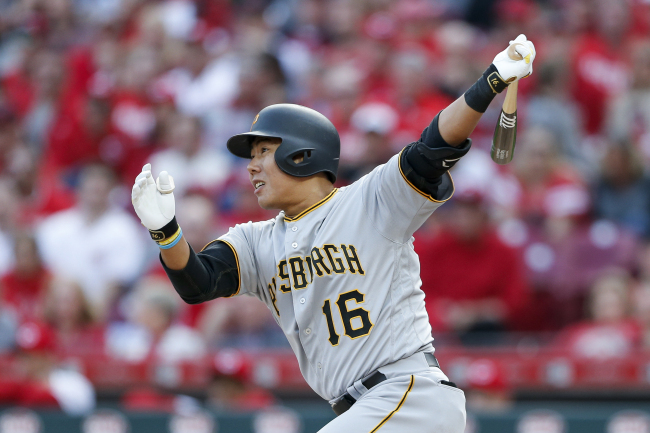 Leeco Sports Agency said the Pittsburgh Pirates infielder sent 30 million won ($26,240) to the Korea Disaster Relief Association and another 10 million won to the Korea Firefighting Welfare Foundation. Through his agency, Kang said he was "heartbroken" by the news of the devastating fire and added: "I am sorry that I can't be there in person with help with the recovery work. I'd like to offer whatever little contribution I can to those affected by the fire." Government data showed Sunday that more than 400 homes and 920 livestock facilities were confirmed to have been burned in the blaze, one of the biggest wildfires in South Korea. The fire started last Thursday night in the county of Goseong, about 160 kilometers northeast of Seoul, and spread quickly to neighboring cities and counties. One person has been killed, and 722 others have been displaced and are staying at 21 emergency shelters. As of Sunday, the amount of cash donations to public organizations to help disaster victims exceeded 7 billion won.